A Foldable Fitness Trampoline So You Can Bounce Here, There and Everywhere! There’s just something about jumping on a trampoline. It makes you feel like a kid again, alive and bouncing and happy. So when JumpSport asked if we wanted to try its new foldable Fitness Trampoline, I—wait for it—jumped at the idea. Turns out, I wasn’t the only one digging on the idea. Both my husband and my dog were equally jazzed at the thoughof having a trampoline at the ready, too. On more than one occasion—or 12—I had to ask (or command, in the dog’s case) nicely (or firmly, in my best pack-leader voice, again for the dog) to use the trampoline for my work. Bouncing is hard work you know. Besides being fun, bouncing on a personal indoor trampoline is a serious workout. At first you’re all bouncing and happy, and before you know it, you’re out of breath, sweaty and your legs are burning. It’s awesome. The newest JumpSport Fitness Trampoline Model 350f, which is the first foldaway version of the company’s personal exercise trampoline, will run you $359, which isn’t cheap, but have I mentioned it’s super fun? See? It folds up so that you can jump just about anywhere. This fitness trampoline isn’t like the ones from the 80s or 90s with those metal springs that made you feel like if you misstepped they’d eat your foot. Instead, it’s stable, solid and surprisingly quiet. Not to mention that instead of having metal springs, there are soft elastic cords that give you the bounce minus the ouch if you do land a bit off the center. While the foldable aspect of the trampoline is cool—especially for those who want to bounce here, there and everywhere—getting the trampoline folded and unfolded is a bit of a skill that takes practice and brute strength. Additionally, I found that after a few weeks of use, you have to go back in and tighten up the legs as they can start to unscrew over time with all of the bouncing. However, to be totally transparent here, my household seriously tested this trampoline. My husband bounced on it as hard as he could (which is HARD), and my dog sometimes even jumped on it herself as she ran to see what the FedEx man was delivering (Oh, that evil FedEx man, always delivering packages.). And me? Well, I tried the fun cardio and strength workout DVD that came with it (while nothing to write home about, it’s pretty solid and shows you how you can use the trampoline for abs, push-ups, cardio drills and so much more), but I mostly used it as a fun way to sneak in activity every single day. Now that my treadmill desk is gone, I bounce for a few minutes every couple of hours to get off my rear and take a break. And I routinely bounce during commercials when watching TV, especially The Biggest Loser. And I can’t count the number of times my husband and I have had a silly jumping contest where we try to perfect our Mario Brothers jumping impersonations. Jumping on a trampoline is awesome because it’s a low-impact activity that both works the legs and the heart, but my favorite thing about it is that it really doesn’t feel like a workout. The act of jumping is truly joyous and makes you feel like a kid. I know it’s pricey, but if you could use a little more play in your exercise, this is well worth it. 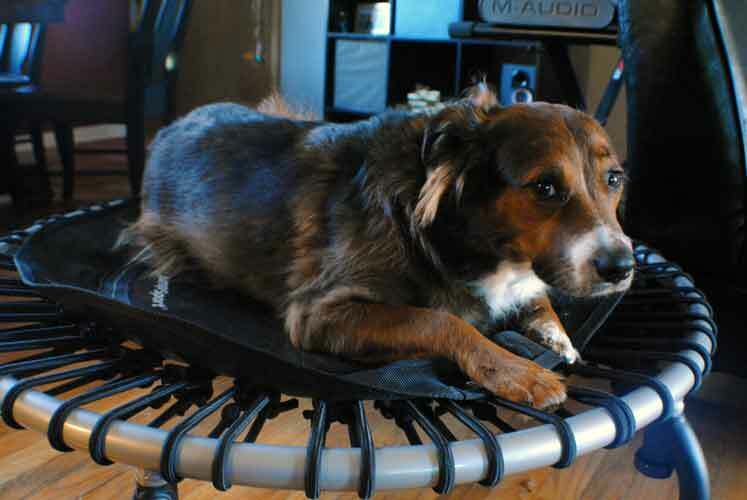 And, hey, it doubles as an elevated dog bed! Never, they kind of scare me to be honest, that I would bound off, hit my head on the ceiling you know all those weird things that only I could possibly do. Did you feel like there was a wide range of exercises for it? 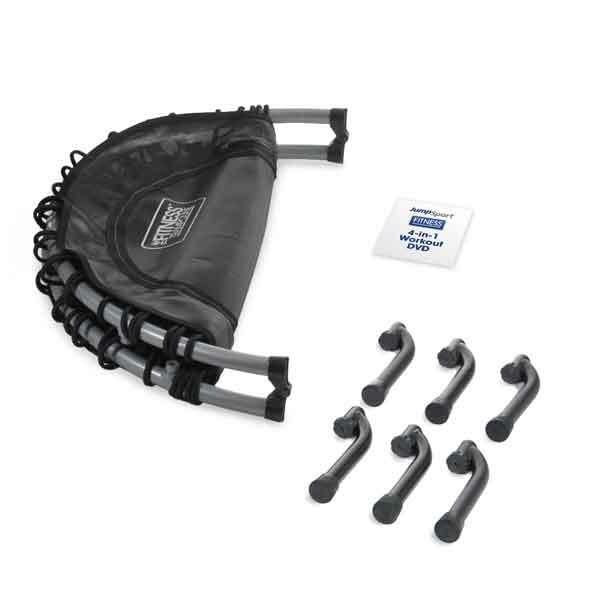 I’m usually a sucker for affordable fitnessy things but when it comes to the pricey ones (erm, trampoline) I can only reason buying it if it’s wonderfully multi-functional.I feel like I’d really enjoy occasionally using this but might not get enough out of it to warrant the price. Although I’m sure my dog would get pretty stoked. How high should my ceiling be before I think about purchasing one? Living in a NYC apartment might be tough. Lower ceiling and noise sensitive neighbors. Sounds like a great workout though. It depends on how tall you are, but you’re going to need about three feet above your head to jump safely (that takes into account the trampoline being off of the ground). Check out this article for more guidance: http://goblue.hubpages.com/hub/Best-Mini-Trampolines. 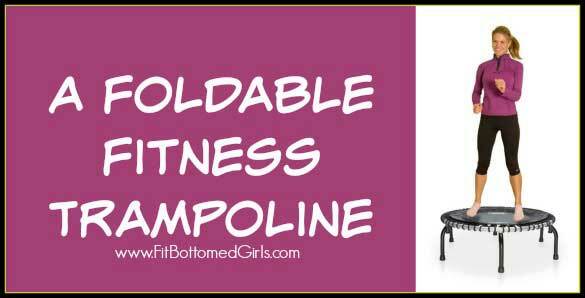 I used to have a mini tramp for working out, but the elastic wore out after a few years so now it is in the toy room for the kids to play with, but i am getting another one soon enough, it was a great cardio workout and super fun! Did this hurt your knees?